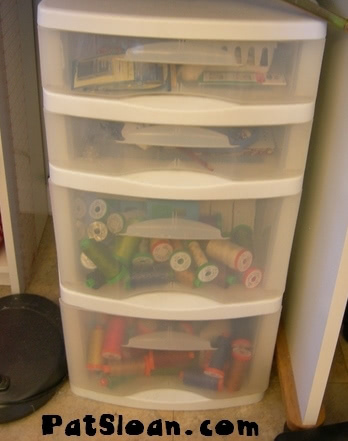 The last item to look at in our studio organization series is thread storage. Are your threads a tangled mess? Can’t find anything? If you happen to use a lot of thread colors or types of thread, storing them well is mandatory! This unit holds my thread by color. It is made for paper, so it has shallow draws. That is the best part for thread storage as my threads are only “Two Deep” and I can easily find what I want. But it’s not as sturdy as I’d like so I do not move it around. So far so good! I used to keep my thread in this unit under my sewing desk. These can be found anywhere that sells clear containers. I’ve had mine a long time. The problem with this unit is that the lower drawers are deep. This makes them less useful as I can’t find anything. And yes this is a REAL photo of the thread dumped in there! I have boxes of threads behind what you see, so it’s actually sort of useable as these are my most used colors from my collection with Aurifil. And I have skeins and balls of hand work threads. I tried a lot of storage ideas and these are the best for me. The long skinny drawers help me keep them somewhat tidy. You and find these at craft stores. I have many of them stacked in my pantry storage… stacked high… but we won’t discuss that… wink! From Susan … I have a question that so far I have not seen anyone address. I too like to sort by color, it makes it easier for choosing fabric for a certain quilt. But how do you sort multicolored fabric, when one color is not the focus? My response… Most of the time a multi-color fabric has a BASE color.. white.. black… navy. Audition the fabric in the different groups you have until it feels at home. There is no right answer, just where it fits for you. Megan asks … How you organize by project? I have whole kits made up for quilts, how would you get those into your purging/cleaning? My response… If my kit has not been started I have a box for those. My “future project box”. I must STILL love it for it to stay there waiting it’s turn. I regularly check to be sure I’ve not grown tired of it. If I have grown tired, and still love the fabric, the fabric is removed and stored with color. TheaM asks … When it comes to storage and organization, I need help with methods that work with sloped ceilings! All my previous sewing studios have had 8′ walls. Now I’m in a studio with 4′ walls and sloped ceilings! It doesn’t leave much wall storage or design area – and most of the ideas I’ve had so far have not worked out as well as I’d hoped – having to limit ‘standing areas’ and ‘short zones’ too, so floor plans are awkward. Help! My response… This is very tough Thea. Maybe custom shelves that fit up to the slope nicely. If you have a cutting table it should have shelves under it as well. A design wall can be movable, so you lean it against the slope and move it when it’s in the way. I am thinking you need a secondary storage area that has more space.. wink! We have several items to give away for today’s post. See below for how you can WIN! 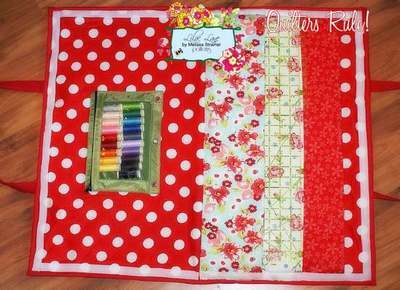 Just last week, Melissa Stramel from Lilac Lane released this great pattern that you can make for keeping all of your rulers in one place: Quilters Rule! Melissa has generously donated five PDF copies of her new pattern. It’s time to get organized! 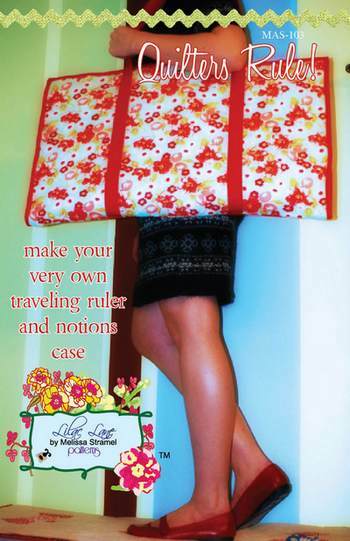 Get started with a case that will hold all your quilting rulers as well as notions. It’s perfect for traveling to quilt retreats, but equally handy for keeping all your rulers together when you’re at home. No more searching for the lost one! The fine folks at Interweave have donated this book: Inside the Creative Studio: Inspiration and Ideas for Your Art and Craft Space and the latest copy of Studios magazine. Last week, Michele in her Digital Storage post shared with us how much she loves both Dropbox and Evernote for keeping her digital life organized. We have a few more upgrade codes to give-away with this post for both. You have two ways to enter the give-aways. First, leave a comment below answering one of the questions from our readers above or share your favorite organization tip.. make it a good one! Second, enter the link party below showing off your “after” or “in progress” organized, creative space or your thread storage. To join the link party: create a NEW blog post (within the last week) on your own blog, take a photo or several photos for your blog post. Link back to this post, or to the Learning Center main page. Come back to this page and add your post to our Link Party below. All winners will be randomly selected Thursday, March 8th. If you have questions or need help joining the link party, contact Michele. Please note: Links not following the rules indicated above will be removed. Fabric Storage Tips and Share your stash to Win! What did you think of the first month of the Learning Center? Fun eh? Starting Thursday, the first day of March, our new topic for the month will be Quilting: Back to Basics. See you then! I store my threads in a similar manner, but I don’t have quite the large supply as you so I use the shallow 6-drawer plastic drawers that tuck into my bookcase. Threads are separated by color and you are right that the spools are easy to find. Pat, I would like to address Megan’s question pertaining to storage of projects. What has worked for me is using the jumbo size Ziploc bags. I add supplies and materials so it is ready to go, or I add to it as I purchase (or find) items. The bags are somewhat transparent so you can easily see what is waiting for your magic touch. They can be hung on the back of the door, in the closet, or on a hook on the wall. They can also be tucked in shelves, in a suitcase, in drawers or even under the bed. Another great benefit to these bags is that your project is ready to go should you be heading out on a trip, to a workshop or to a friends house to craft. I’ve added my link to a blog post I did on this. My pearle cotton thread used to be tangled and messy. Now I store it in a plastic container… But I roll each skein on an empty spool, the empty spools hold a skein without any difficulty and I can tuck the end into the area provided for thread. for the sloped ceiling – put in low cupboards all along the wall, make them so deep that you can stand comfortable in front of them (the slopy ceiling!) if possible let the top board of th cupboards come 8 inch further out, so you can fit your feet under the whole thing, lot’s of work space and lot’s of storage space that way. As for the slopey ceiling itself I know that Ikea has a special shelf system for them, so I’m sure other’s have too. I often organize my multi-colored fabrics into their own ‘Multi-Colored’ bin. Sometimes you just can’t decide on a base BUT these can be perfect inspirational fabrics or focal fabrics for a piece that you work from to pick your other fabrics. I store my thread bobbins in a 7 day plastic pill keeper. The large ones are perfect for this. This is a super easy way of taking my thread to retreat. My mom stored perle cotton inside individual envelopes that were clearly labeled with color and number. These were then stored in a boot box (which was huge!) in “rainbow” order. She had ever color under the sun and everything was relatively easy to find. This system could be improved by using window envelopes so that you can see the thread color through the window. I bought a rigid portfolio at an art store for $20. It’s made for carrying around large drawings on paper but my cutting mat and rulers fit in there perfectly. It’s perfect for carrying them around, and also can be hung up in the closet out of the way when I need more table space. I am forever tearing out pictures from magazines, ads, even the newspaper, for reference, inspiration, or “I want to do something with this”. I always chuckle when someone suggests putting that sort of thing in a photo album in the see-through plastic sleeves…I would need DOZENS! My pile got to be very Tower of Pisa, in both height and angle, so I started looking for a file cabinet. Scored one, made folders for applique’ to zebras, and now can rummage through in safety to find what I need. For multicolor fabrics, I have a category I call ‘focus fabrics’ and they get a drawer of their own. For my large cones, I have 2 plastic 3 drawer units. I have them sorted by thread type first and then by color. I love to see photos of threads that are set in the open, but I prefer to keep mine where they won’t get dusty. 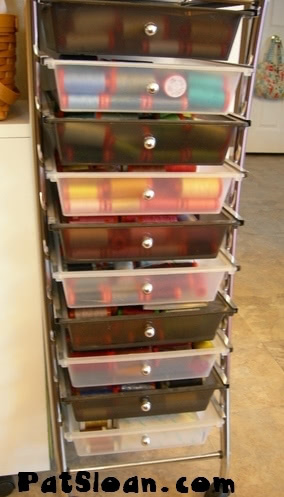 (I have now more thread than drawer space so they go into plastic totes) For my fabric, 2 yds or less gets folded and put into a cubby cabinet that I purchased from an office store that used it for displaying scrapbook paper. I put a curtain rod on the front and hung an old curtain. For larger cuts I have them folded on a metal shelving unit. Just wondering if anyone has seen a quilt carrier or something that would work to take items to guild share events. You know something to take the place of a shopping bag/ I was thinking about making something kind of like the carrier you put wood in to bring it inside that just has sides and handles and no ends so it will accomodate all sizes and bulk? Ideas anyone??? My studio too is in a room with short walls and a sloped ceiling. I got plastic shelving from W-mart that fits the height of my walls. They come apart and are so flexible. Then I got plastic bins that fit on the shelves voila! But since I prefer the nice 72″ bookcases I got the idea to put them as far back against the wall as I could – that left some space behind which is very useful for storing extra tables, etc. I use the fuzzy ponytail holders for babies’ fine hair (like little scrunchies) on spools of thread so they won’t unwind. My sewing machines sit on my grandma’s old piano bench (we no longer have the piano). It holds 4 and still looks cute! A box for 12 tacos from taco bell holds my blocks for transporting railfence layouts perfectly right now…all lined up in 3 rows. LOL, it drives my teens nuts though since they think it has tacos in it…gets them EVERY time! Susan asked about sorting multicolored fabrics. I sort them two different ways. If there is a predominant color, I put it in that color’s stack. The rest get sorted by print type: floral, animal, children, etc. I also have a separate stacks for panels, solids, batiks, and Samoan fabrics. I store my projects in the jumbo ziplock bags too. Then I keep the bags in a large clear plastic bin. I also keep orphan blocks and piecings in ziplock bags in the same bin. I group my cotton by colors with the multi in it’s own space. I also have a plastic bin for Christmas, other holidays and polka dots. I have a lot of polka dot fabric. Small pieces of stash I keep in those plastic drawers, according to color unless I have cut them certain sizes then I sort according to 2″strips, 3″,4″ etc. One thing I have had forever and still use is a metal handyman’s cabinet. It is 20″ X 12″ and has 60 plastic drawers. I keep most of my notions in it; the bottom 3 rows are for buttons, I have snaps, hook and eyes, needles,sorted according to size, thimbles, crochet hooks, pencils, pens, little appliques, I even keep dice, something my grandchildren lose on a regular basis, and stray marbles. Each drawer is labeled. It perches on 2 sets of the plastic drawers stacked,and has been a great organizer. To answer TheaM’s question, Ikea does a stepped storage solution in its kids section which is perfect for sloped areas. It has a wooden frame, with runners for drawers, and there are a variety of drawer depths available in a range of colours. They do flat topped ones too for other areas, and can be stacked. Hope that helps! I have thread stored all in one box for overflow, and a compartment drawer to my sewing table that my husbund made for me for thread currently using. I keep my floss in a cute little baby suitcase with a featherweight printed on the top. Opps. btw, loved this organization series!! !THANK YOU! 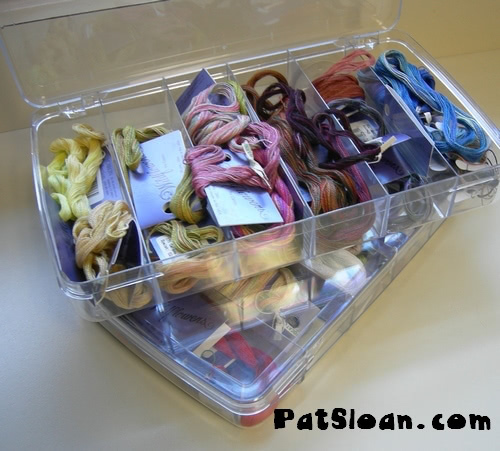 I sort my scraps by color and store them in clear plastic shoe boxes. I bought two modular shoe shelves at Target, stacked them and store the boxes on them. All my lovely scraps, easily accessable! To TheaM…… 4ft walls!!! Yikes! You didn’t mention if you have any type of closet in your sewing studio. I take a flannel backed tablecloth and roll it up inside the closet in my laundry room. When I need to set up a design wall, I just unroll the tablecloth with the flannel side facing me. It is easy to store and does not take up any space. When done, I just roll the tablecloth back up and store it on the shelf. This could also work in front of a book case. I guess I don’t have enough thread! All my thread fits nicely in one little drawer. My hubby just built me some heavy duty shelves in my sewing/office/homeschool room, but I would like to know how to fold my fabric so that it isn’t all different sizes for stacking! I too love the plastic storage drawers. I have one with 3 smaller and 2 bigger drawers. The bottom two are full with serger thread, as I also do a lot of sewing and altering. The top three are full with sewing thread, but instead of laying them down, I stand them up. You can get quite a bit of thread in one drawer this way, and mine are so full that not much falls over. Rearrange them a little in a colour block, and you know approximately where in the drawer you have to look for a certain colour. Has worked for me for years. For Susans question – I have a box just for multi colored fabrics. that way when I am working on something I can always pull that out too and see if any of it works with the project. That way it does not get lost in a bin of a certain color! I love using clear glass apothecary jars with tight fitting tops for storage of thread, buttons etc. They look cheery and keeps them all together. I shop yard sales for them and buy them for very little money. I have a storage unit just like the first one you showed and put my thread in it but the drawers always seem to fall. I even tried putting a plastic tie around the backside to try and pull it narrower but it doesn’t seem to work. Otherwise I love it! All my spools of thread are stored on specially-built racks that hang on the walls (it helps to have a crafty hubby!!). Well, that’s all the normal ones. Serger thread is kept in a shoebox, in the desk on which my serger sits ($5 yard sale, but solid wood & sturdy as all get ou). The little Sulky spools are in THREE, yes, count ’em THREE of the Sulky Slimline cases. When we lived in our RV, they fit under the sofa nicely, and were totally out of the way!! For buttons, bindings, ribbons and other trims, they each have their own see-through stackable box. LOVE that they are always grouped together & I can always see what I have on hand with just a glance. I’ve been loving the all the storage ideas & solutions. And, for Susan, who has trouble sorting the multi-colored fabrics – well, I have a whole pile that’s just floral, and another one that’s geometrics and stripes…and yet another one that’s fish. Batiks that are multi-colored, well, as Michelle suggested, I use the primary or background color for sorting them. My tip is for storing embroidery thread. This works well for having it with your project or for storing in a drawer. I use the empty “Crystal Light” or similar containers. The label slips right off and you can see through the container . The container is big enough to hold like four of the ball skeins and tons of the small skeins. (Not sure if that is what they are called). Thank you Pat and all your Sponsors for an awesome giveaway and a chance to win. I use the Iris drawer towers for my thread. Like you I sort by colors and I have multiple drawers per color. I label the drawers for quick access. I have a thread rack on my sewing table that I put my color palette threads in for quick access. I have a double-sided plastic carrier for threads for when I go to retreats. I use the Iris towers to store and find just about everything. Labeling is the key. Storage of multi-coloured fabric: I store these as a separate ‘colour’, grouping my multis with no obvious base colour together in a storage bin. Then if I can’t find what I want in my colour-themed bins, I go and look in the multi bin. I use a discarded dresser for storing my sewing items. The shallow drawers hold ribbons and trims. The deep drawers hold patterns and projects in-waiting. I have a suggestion for TheaM about storage in a room with a slanted ceiling. I bought storage from IKEA for my attic room. My ceiling started at 6′ so I had more room to work with but I think these storage units might work for her too. They are called Besta and come in different finishes and can be mixed and matched. They might also have other products that would work. I know they have the metal framed wire baskets for a great price…much cheaper than other places and they are within the 4′ height limit. They are called Antinous on their site. I hope this helps! I have learned so much! I have for years had to go to the basement or set up to sew at the kitchen or dining room table-much to the annoyance of my husband. Well this year my daughter went to college and said”Mom you could put all your sewing stuff in my room if you want!” WOW now trying to get it all organized.It is so nice to go in there and just “leave it” as is without setting up and tearing down constantly. I am is the process of following these guidelines and hope to be organized my the end of March! I store my projects in jumbo ziplock bags. All of my fabric is sorted by color and put in covered translucent bins. Fat quarters have their own bin. I have one small bin for “scraps” which I cut into squares and store separately. If a scrap is not square worthy, I cut it into strips for strip quilting. So far, my organization works for me, I think it is a process of adapting as your stash expands. To answer the thread question, I store my most frequently used thread colors in a matchbox car plastic storage case(found in the toy dept). It has a handle so it is good for traveling and is clear on both sides so you can easily see your thread. My other thread is stored in plastic shelving units. I have some of my threads hanging on thread spool things above my serger, but my embroidery and longarm threads are just in cardboard boxes at the moment. I don’t have as much thread as Pat. I store mine on a rack that hangs on the back of my sewing room door. I have a very small sewing room (10 by 10) and have to keep things to a minimum. I do have 3 72″ bookcases I picked up at Lowe’s to store my stash. For storing multi-colored fabric, if there isn’t a main color component to the material, I store it separately. Usually these fabrics are special in some way – novelty, plaid, etc. I keep them in separate piles and store them alone. I didn’t get as involved as I’d wanted as I’ve been sick but I’m better now and find that there is one last thing I need to organize. All my organizing is great and staying organized except for one small drawer that contains everything from buttons to various needles and lots of odds and ends. I just doesn’t stay organized and soon I am once again shuffling through a mess. That will have to be my next challenge. I have a sloped ceiling and use that as a place to line up shelving or plastic shelving units that fit just up to where the slope starts ascending. I have my sewing table just off the middle of the room so I can easily get around to what I need. Striving to stay organized is ongoing but crucial to making this space work. Actually, having storage “tucked” out of the way opens up more floor space. Wow.! I never thought that keeping you and storing your things can be this organize.